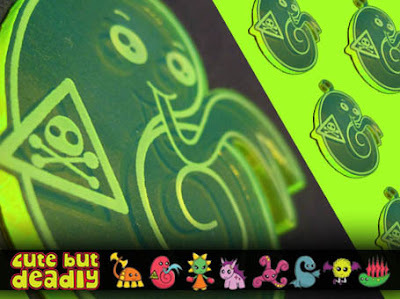 KawaiiPunk - Kawaii Mascot Blog: Cute But Deadly Keyrings! Yes, that’s right, it’s the ideal Halloween gift that keeps on giving - Cute But Deadly keyrings! These wonderful Cute But Deadly keyrings have been produced in association with the equally wonderful Flatties - fine purveyors of urban toys and art! The keyrings (of which there are eight different designs in two different colours) can be purchased from the Flatties website, and at a mere £4 for two you aren’t likely to break the bank by collecting them all! And the best part is… a keyring isn’t just for Halloween, it’s for life! Woohoo! P.S. You can see more of Amy’s amazing artworks at Cakes With Faces. Enjoy!